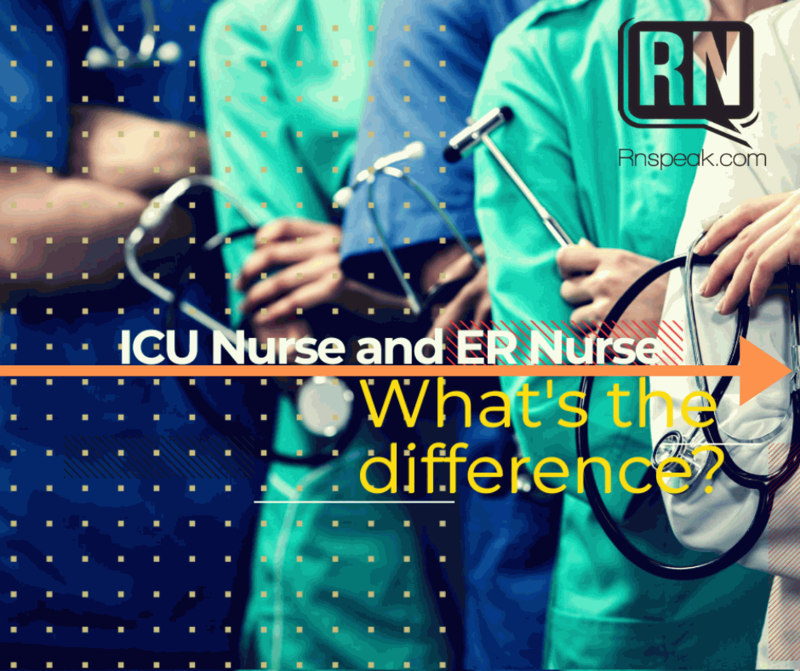 ICU Nurse and ER Nurse – What’s the difference? Are You an ICU Nurse or an ER nurse? It is very helpful to have a good depth of the types of nursing jobs before taking on to your next career path. Two of the most in demand types of nurses will be discussed here. You might want to further read on the details as to know whether you are an ICU nurse or an ER nurse. In this video, Ashley Adkins an ICU nurse, together with Crosby Steen, an ER nurse, discusses on how it is like to be an ICU and ER nurse. Based on their experience, ER nurses are much disorganized while ICU nurses are somewhat similar to an OCD patient. Steen also noted that Adkins, being an ICU nurse as she is, is also very organized in her house. 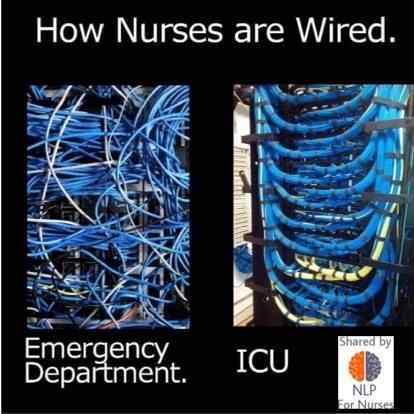 According to them, this picture is an accurate representation of ICU and ER nurses. ER nurses make sure that the patient is treated on what they came for in the emergency room and would always make sure that the patient either gets home treated or be admitted for further observation. On the contrary, ICU nurses must treat the patient as a whole. Adkins even set an example, that when a pneumonia patient comes up to the ICU, it is not just the pneumonia that is being treated but as well as the other organs of the patient that might have been overlooked and affected. They also discussed their biggest pet peeve being an ICU nurse and ER nurse. As an ICU nurse, Adkins said that her pet peeve was when patients are being brought to the ICU and are not clean or saturated. Steen, on the other hand, said that his biggest peeve is when he brings a patient to the ICU or to the admitting room, the bed isn’t just ready yet or the room is yet to be cleaned. But at the end of this video, whether there’s a negative stereotype between ER and ICU nurses, both agreed that both types of nurses plays an important role in the hospital setting. At the end of the day, both types of nurses respect each other in order to work smoothly and must bear in mind that they work FOR the patients and not only for themselves. An ICU nurse takes care of patients who need the utmost care in a controlled setting. In order to treat critical patients, the nurse shall possess specialized skills and extensive knowledge of different diseases as well as their pathophysiology and management in order to provide interventions to sustain the life of the patient. Working as an ICU nurse is a very serious business. It requires a very understanding mind, quick thinking, fast reflexes and the proper skills for the job. ICU nurses take care of the most critical patients and the most fragile patients who hang on life by a thread. Most of these patients are intubated, ventilated and on life-sustaining medications. ICU nurses need to be able to know when to act properly and recognize signs whenever patients are getting worse by the moment and should know how to act swiftly on them. Just like ICU nurses, ER nurses need to be equipped with a quick critical thinking, decisive action PLUS a strong stomach. ER nurses are the first line of medical professionals you would meet through hospital emergency departments for several reasons: trauma, injury or acute onset of symptoms. ER nurses treat patients of several ages coming from different backgrounds. Just like ICU nurses, ER nurses may deal with life-threatening cases and must also be able to resolve and stabilize patients quickly upon their arrival. ER nurses must also learn triage, which is to treat patients in order of life threatening priority. ER nurses should be ready in any time may it be to start CPR on a cardiopulmonary arrest patient or be ready with blood products for a hemorrhage patient. ER nurses must also be quick to. Probably, the hardest part of the ER nurse’s job is to keep calm amidst all the chaos happening. Chaos in the emergency room is highly evident on holidays or if a big accident happens just within the area. In times like these, most patients brought in the ER are in a panic mode, and medical personnel within the emergency room must remain cool-headed so as not to make the patients panic more. Having a calm disposition may also calm down the patient, which allows job within the emergency room be done in a much better way. Another skill an emergency room nurse must be able to possess is multitasking. There will be times that a nurse will be given 10 to 15 patients simultaneously. Because of this, the nurse must be able to organize their thoughts, the chart and must not mix up the patient’s conditions and their management, so as not to mishandle a patient’s case. An ER nurses have personalities that work best in a disorganized environment. They work best during chaos, and because of this, ER nurses have developed teamwork and proper intuition. ER nurses already know what to do when a trauma patient is brought to the emergency room and manage to work through such difficult cases. On the other hand, ICU nurses must work on a well-organized environment. ICU nurses would appreciate shifts that are well-organized, structured and a place where they could work without any distractions or hiccups. Similar to their workplace, ICU nurses work on an organized manner. There isn’t a single ICU nurse that is not meticulous (and may be borderline OCD). Checklists of medications are their companion and highlighted grids are to be seen, which drips to titrate, when to draw blood for laboratory and when to check on the vital stats of a patient. ER nurse, do not have any luxury to be meticulous. Their time are only devoted to assess, react and move on. They need to move fast and do not have the time to make checklists. If they do, they might just bid goodbye to their patients or might aggravate their patient’s condition. Goals of ER nurses are to prioritize, stabilize and move out. Patients being rushed inside the emergency room must be assessed fast by nurses, identify the major problem, treat the major problem, stabilize and transfer the patient to an appropriate department of care because a lot of patients are lining up in the emergency room. For ICU nurses, their goals are long-term goals for the patient. ICU nurses do not just focus on the main problem, but they must be keen on different body systems which might have been affected by the major problem seen in the emergency room. Also, ICU nurses are supposed to build up rapport with the patient’s family and they have the responsibility to educate the family of the patient. So if you are now thinking about entering the world of nursing or just have finished taking up the board exams, you might want to consider one of the two kinds of nurses mentioned above. Of course, you have to make sure you are very well fit and capable when placed in such environment. Have you worked as an ICU nurse or ER nurse? Drop down your comments or experiences below!